julie, I love your website and blog. You are so willing to share such great information and resources. 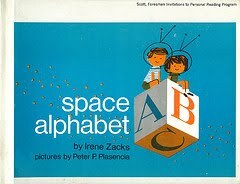 I'm commenting on this particular link to space alphabet because I just finished a book dummy class and I created an animal abc book; I'm always on the look-out for really unique & clever abc books. This one is awesome. Thanks so much for sharing it. You are an inspiration. I am in the infancy stage of illustrating children's books (I'm a student). If you could give me one morsel of advice what would it be? Your blog is a great resource and I'm so happy to have found it. Thank you for every entry you post!